Alice has sharp knees. And because she grows slowly, they wear away at the pants longer in one place. 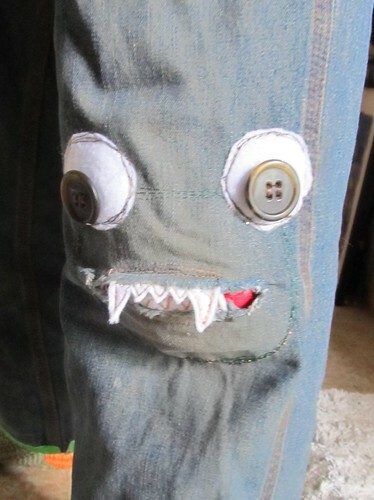 So I've gotten creative mending her pants, because she doesn't outgrow them fast. She's had pandas, cats, dolphins, and a spiderweb that said "some pig". When I saw these monsters on a friend's page, I knew Alice needed one. These have braces too, out of silver thread. Because even monsters need to have nice, straight teeth. Pictures of the purple girl in her new purple boots, please, with matching purple hoodie.